Earlier this month we reported on International Volunteers Day, and took the opportunity to highlight some of the volunteer efforts being undertaken in Lao PDR. One of the Australian volunteers supported by Australian Volunteers for International Development (AVID) and the Crawford Fund is Plant Quarantine and Biosecurity Advisor, John Burley. John was featured in a report published in the local English language newspaper, the Vientiane Times, to help celebrate International Volunteers Day (Monday, 5 December). 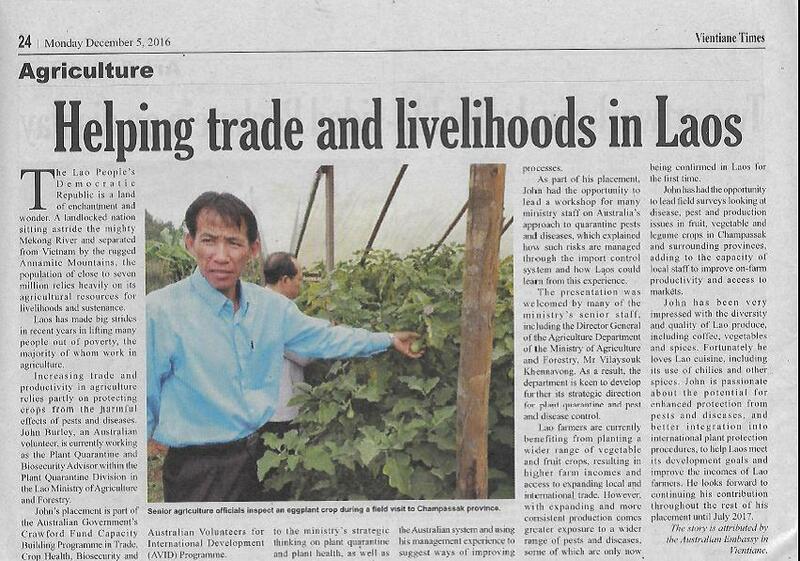 The article (pictured below) provides an overview of what John has been doing in Laos, and how important his work is to increasing trade and productivity in agriculture in Laos. John has been volunteering in the Plant Quarantine Division of the Lao Ministry of Agriculture and Forestry to help protect Lao’s crops from pests and diseases. Using his skills in plant health, and experience in quarantine processes and management, he led a workshop on risks and quarantine procedures undertaken in Australia for Lao ministry staff. He has also organised field surveys to help local staff improve on-farm productivity and market access. John’s placement in Laos continues until mid next year. For more detail, you can read the article here.